Mayor with a reputation as a moderate suggests his ‘team’ underestimated how contentious the rhetoric would be. 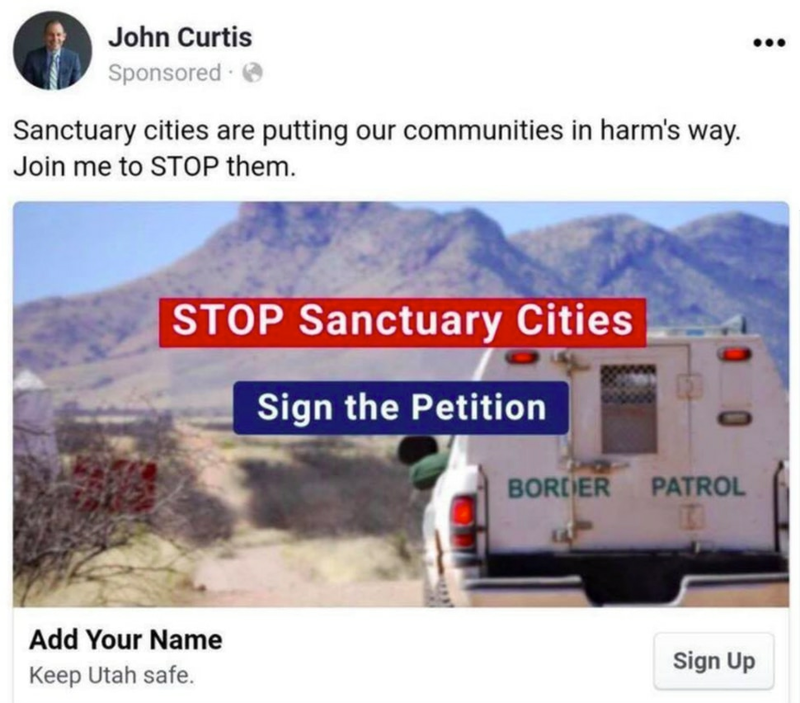 A screenshot of John Curtis' campaign ad shared with The Salt Lake Tribune. 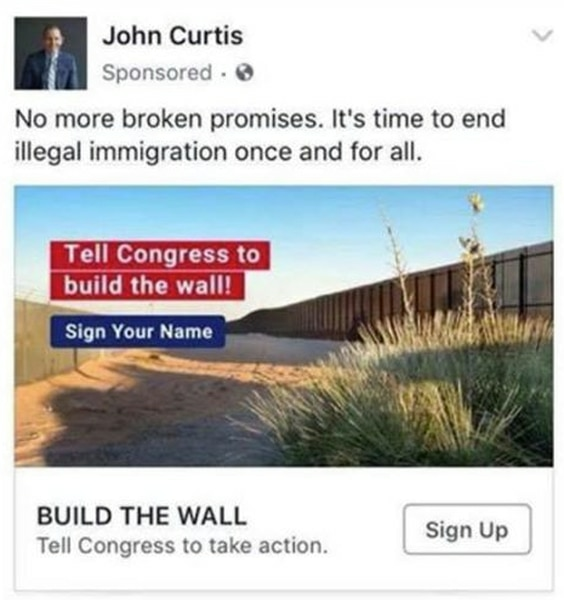 The messages on immigration were quickly attacked as hostile and Trump-like while Curtis suggested his “team underestimated how contentious” the rhetoric was. The Republican (and automatic frontrunner) in the race to replace former Utah Rep. Jason Chaffetz, who stepped down in June, has been billed as a moderate candidate and was criticized in the primary for not being conservative enough. The ads, though, seem to play off of some far-right phrases now-President Donald Trump used during his presidential campaign. (Scott Sommerdorf | Tribune file photo) Candidate John Curtis speaks at the Republican Special Convention for Utah Congressional District 3 to choose the candidate to replace Congressman Jason Chaffetz, held at Timpview High School, Saturday, June 17, 2017. Curtis didn’t vote for Trump and his campaign spokesman, Danny Laub, said Tuesday that the mayor “is his own man, is himself and has his own opinions.” He referred most other questions to Curtis’ response letter. The cost to run the ads — which are part of a series that also includes posts about tax reform — is not included on the mayor’s most recent financial disclosure, and Laub declined to say how much the campaign spent on the digital messages. The Salt Lake Tribune saw and verified the ads through several screenshots shared online. In his 500-word reaction to the subsequent criticisms, Curtis included his platform for immigration reform. He proposed securing the border between the United States and Mexico while more strictly enforcing the law. “If the best idea to protect our country is a wall then I will wholeheartedly support it,” he wrote. Curtis also recommended penalizing undocumented immigrants who come to the United States and commit multiple or serious crimes, assimilating individuals to “become loyal, productive Americans” and giving people a chance “to get right with the law.” None of those items, he said, should amount to amnesty. Provo was considered a sanctuary city when Curtis took office eight years ago, he said, but that designation has since been lifted. Many commenters responding to Curtis’ public post said they were “disappointed” by the mayor’s ads. A few called the mayor “insensitive” and said they no longer planned to vote for him. Some said they appreciated his acknowledgement that the messages were problematic. Curtis’ competitors in the Nov. 7 general election — including Democrat Kathie Allen and the United Utah Party’s Jim Bennett — were quick to call the mayor on the carpet. “He is AGAINST sanctuary cities. Couldn’t be a bigger contrast with my position,” she noted on Facebook. “On the campaign trail, John has tried to distance himself from President Trump, but with this ad, he’s embracing one of the president’s most extreme proposals,” he said. Curtis has polled strongly in the race — where registered Republican voters outnumber Democrats nearly six to one in the reliably red 3rd Congressional District — outpacing Allen in the most recent survey by more than 37 percentage points. The mayor, at 54 percent, also towered over Bennett, son of the late three-term Sen. Bob Bennett, who fetched 6 percent in the mid-September survey. The three candidates will spar during the Utah Debate Commission’s Oct. 18 showdown and will join Libertarian candidate Joe Buchman in an Oct. 13 debate in Sandy.